What is Kenya’s Biggest Coffee Morning? 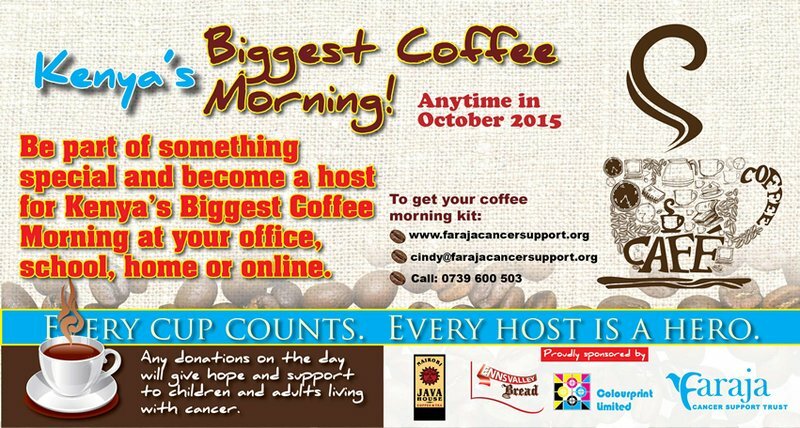 If you’ve heard about Kenya’s Biggest Coffee Morning – and want to find out more – you are at the right place. Put simply, every October, lots of people decide to do something special by hosting a Kenya’s Biggest Coffee Morning (KBCM) at home, work or school. It’s our biggest fundraising and awareness event of the year. Every drop of coffee drunk, and delicious nibble of cake consumed will give hope and support to children and adults living with cancer – no-one should have to face cancer alone. All our services are provided free of charge. How does it work? What shall I do? At the very heart of the event is our hosts. Wonderful people who put their hands up, and decide to run a KBCM on behalf of Faraja Cancer Support. Collectively they make an enormous impact. In 2015 over 3,000 people either hosted or attended a KBCM raising Kshs 4 million. Many had an expert cancer speaker present. The goal for 2016 is to raise Kshs 6 million – together we can make it happen. It’s an easy event to do – both in Kenya and overseas. A great way to involve and teach children the importance of philanthropy..
Works well as a company networking event which give staff the opportunity to learn from expert cancer speakers. To remember a loved one who has had personal experience with cancer. To engage customers in a different way. To support Faraja and make a difference to those living with cancer in Kenya. 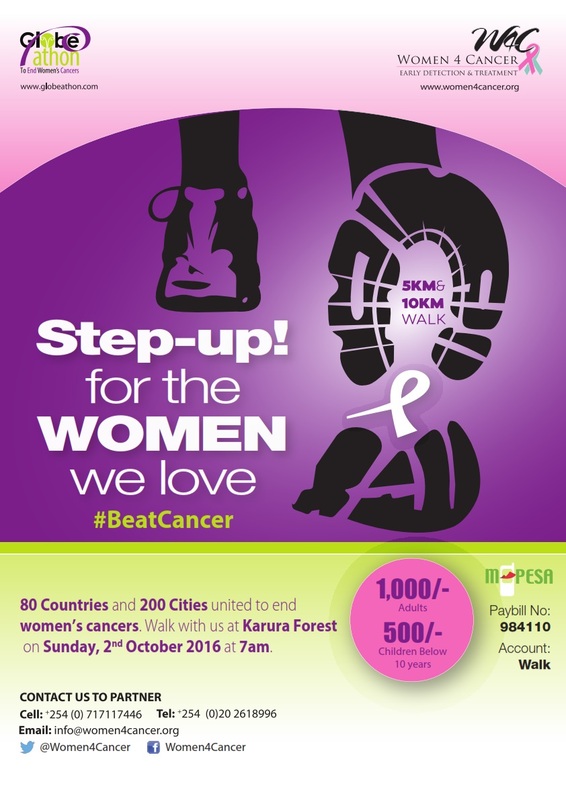 Ksh 300K – Faraja’s monthly breast cancer support group meetings for a year. When does Kenya’s Biggest Coffee Morning (KBCM) happen? Any day in the month of October. You pick a date and time in the month that works best for you and the people you would like to invite. What is a KBCM’s Host? Wonderful people, at the heart of the event, whom make KBCM happen. A host(s) typically sets the date, works out who to invite and decides upon a theme. They then promote and host KBCM. Most enjoy it so much they do it again the following year. Where do KBCM’s take place? In the past KBCM’s have taken place in school grounds, at home, bridge clubs, hairdressers salons, spas, hotels, company offices, art galleries, country clubs, banks and farms. I live overseas can I host a KBCM? Yes! Last year we had KBCM held in Australia, Canada, France, New Zealand, UK and Sri Lanka. We can email you the support kit and look forward to seeing some photos of your event. How much does the event raise? In October 2015 there were 44 hosts, 3000 people attended raising Kshs 4million. In 2016 we hope to raise Kshs 6 million, and the goal for 2016 is 100 hosts to help us do it. What support is given to a KBCM Host? Lots! The fundraising team is by your side every step of the way. At the beginning we will meet/call to chat through ideas that could work. You will also be sent at KBCM support kit which includes many ideas and items such as invites (e-invites and digital), posters to promote the event, posters to put up at the event, collection tins and clear examples of where the monies go. The Faraja team, expert cancer speakers and cancer survivors often attend the events to. What do the expert cancer speakers talk about? These can be tailored, but as 70% of cancer is diagnosed at a late stage in Kenya, when difficult to treat, we find a talk focussed on ‘prevention and early cancer symptoms’ is very beneficial. Healthy living topic is a popular request and the feedback we receive when a cancer survivor speaks is very positive. What other support can be given? Often companies will make a corporate donation as they truly benefit the health and well-being of their staff. How much should I expect my KBCM to raise? We encourage hosts to be ambitious with their goals. So many people have been touched by cancer you will find people are normally very supportive and generous. Last year the average KBCM raised Kshs 147K, but they ranged from Kshs 38K to Kshs 1 million. Every single shilling was put to good use. To one of Faraja’s core services that bring hope and life-saving support to those living with cancer in Kenya today. This include running monthly support groups, free complementary therapies, movement classes like yoga, counselling and providing medical assistance grants. reduce the prevalence of cancer. Facilitated full surgical cervical cancer treatment for 6 women in need. 15 others require urgent assistance. most of whom will be without symptoms. treatment and patient follow up programmes. With your continued support, we are targeting to facilitate and ensure that Cervical Cancer early detection and treatment is accessible to at least 1 million women in 10 years. We are inviting you for the 4th Annual Globeathon Walk to be held on 2nd October 2016 at Karura Forest. October is on the corner. Most organizations shall be offering Cancer Screening at designated places near your. K indly visit Cancer Screening organization websites and this website to check the available centres offering Cancer Screening. In case you would like to enquire, always email info@kenconetwork.org.